Leola Hall (1880-1930) was born in San Leandro, in northern California, to a family that be her own account “was not moneyed.” Her father was a miner who spent a good deal of time in the remote parts of Arizona, occasionally joined by his family, who had to travel as much as 150 miles to get from the nearest railroad station to his latest claim. Leola loved these adventures and took advantage of her new-found freedom to learn how to ride horses and round up steers. During these years, she began to make music (she could play seven instruments by ear) and develop an interest in drawing and painting which led her to artists Raymond Yelland and William Keith. While recovering from health problems, she put her artistic talent to use by creating designs for sofa pillows and decorative work burned in wood. Ever the entrepreneur, she copyrighted her designs and began saving the money that would later launch her career as an architect. In her early twenties, she began to accompany one of her relatives, John Marshall, on his daily rounds as a contractor. She became fascinated by building plans, details of construction, and the financial arrangements that made buildings possible. Before long, she was working in Marshall’s office as an assistant. There, she gained a solid knowledge of design, construction and financing, and soon bought a parcel of land with money she had saved. With a little help from Marshall, Leola designed and built her first house. She began managing her own affairs exclusively, buying more and more land, and taking full responsibility for the design, building and decorating of the houses. From 1906 to 1912 Hall designed and built somewhere between 40 and 100 buildings, almost all of them single-family dwellings in the Elmwood Park district of Berkeley. She was able to capitalize on her artistic talent and construction experience to provide the neighborhood with houses that were artistic, practical, and affordable for the growing professional class. By acting has her own designer, financier, contractor, and (on occasion) construction foreman, she eliminated costly middlemen and was able to accrue wealth while passing savings along to her clients. Given Leola’s independent spirit, evident in all of her experiences, it is no surprise that she bridled at the notion that women were denied the vote in the world’s largest democracy. She had shown herself more than capable of succeeding at a whole variety of men’s endeavors, and her suffragist activities seemed to grow in direct proportion to her success as an architect. She was constantly racing from meeting to meeting in her small car loaded with suffragettes. In 1912, Hall married Herbert L. Coggins, an author, publisher and lecturer on ornithology at the University of California. To provide what one newspaper described as a “nest for self and other self,” she designed perhaps her finest building, the so-called “Honeymoon House.” The house was clearly designed for a socially active, childless couple. The bedrooms and kitchen were small, pushed to the back of the house, while the living room was large and open, perfect for concerts and political gatherings. After her marriage, Leola appears to designed fewer and fewer buildings, and increasingly focused her attention on painting. 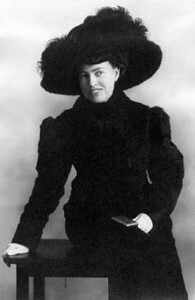 Her work, which consisted of landscapes and portraits of famous writers like Joaquin Miller and Edward Markham, was often exhibited, and frequently praised in the press. Leola Hall’s legacy is both political and architectural. She was the only woman architect in Berkeley (Julia Morgan was San Francisco-based) at a time when women were not even allowed to vote. Her paintings were displayed in the best galleries and drew high prices at auction. The profit from these paintings was often donated to the many liberal causes she espoused. She designed dozens of beautiful, practical Craftsman-style homes that stand as a legacy to her resourcefulness and artistic talent. Leola and Herbert lived together in the Honeymoon House until Leola’s death in 1930. When Herbert died in 1975, he bequeathed a good deal of money to many of Leola’s favorite causes. —excerpted from “The Success of a Woman Builder, Leola Hall” by John Ribovich, Style 1900, vol 15 no 2, May 2002.